Once Holden had been a globetrotting TV personality but much drama in his personal life has made him an agoraphobic recluse now being scared of all the fresh air and wide space behind the front door of his big mansion. Spring time brings in shy and socially awkward gardener Adam, who discovers an unknown dead man in Holden´s neglected garden. Of course that feeds the suspicions of the gossiping Smithfielders and makes Holden´s quiet life exciting, as do this feelings for Adam he has. Although L B Gregg has written another entertaining story with witty dialoges and even a murder case, this one is my least favourite of all the „Men of Smithfield“ episodes.The main reason is Holden, who is more like a whining, self-centered, randy old devil trying to seduce his virgin employee while the homicid investigations in his backyard are ongoing. I tried really had but could not warm up to him. The mystery had too many side characters being somehow involeved or not and the missing emotinal connection between lusting Holden and sweet,young Adam, this time it did not work for me. Despite all those flaws I am always spending an enjoyable time and feeling like one of those gossiping townspeople following the scandals at the Worthington Mansion thanks to Shannon Gunn and his great voice talent. He not only portrays Holden and his dirty inner monologes perfectly, the misgiving housekeeper, the holier-than-thou neighbor, the preppy banker, the drunken brother, the overeager sister-in-law, they all get a matching voice from him. It is so much fun listening to his fluid and vivid narration of this story! Hurra !!!! 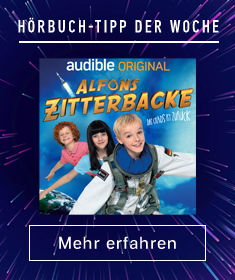 Die zweite Folge von Großbritanniens letztem Zauberlehrling als Audible Original Hörspielbearbeitung ist da! Wie schon die erste Folge ist diese Umsetzung wieder magisch gut gelungen. Hintergrund- und Begleitgeräusche passen perfekt zu PC Peters Jagd nach magischen Kriminellen mitten im bunten Treiben von Soho. Kaum hat man die ersten Abschnitte gehört, setzt der schon bekannte Sog ein, die Geschichte am liebsten in einem Rutsch durchhören zu wollen, weil man unbedingt wissen möchte, was es mit den Jazz-Vampiren und dem geheimnisvollen ethisch fragwürdigen Zauberer auf sich hat, und natürlich wie es mit Leslie weitergeht! Einen kleinen Hauch von „oh wie Schade“ gab es bei mir dieses Mal dennoch, weil die Umsetzung der Dialekte (schottisch, walisisch) in der Deutschen Version natürlich nicht nachzumachen ist. Trotzdem macht es riesig Spaß mit Peter und den Jazzband Mitgliedern durch die Clubszene zu tingeln oder den Action geladenen Szenen vom Ash / Krankenwagen und der Verfolgung der Bleichen Lady zu folgen. Am deutlichsten fiel mir der Unterschied bei Simones Figur auf. Im englischen Audiobook ist Kobna Holdbrook-Smiths Interpertation von ihr schon beeindruckend. Aber in der deutschen Neuvertonung wird Simone, dank Laura Preiss, regelrecht lebendig und sprüht vor Energie. Man sieht sie und ihre Schwestern fast zum Anfassen nah vor seinem inneren Auge, während die immer komplexer werdende Geschichte sich rasant weiter entwickelt. Klasse gemacht! Das sind fast 10 Stunden ungekürzter Hörspielgenuß vom Feinsten mit bunter Kopfkino Garantie und hochgradigem Suchtpotential! Jazz, Magie, Spannung, jede Menge britisch trocken-schwarzer Humor und Sprecher, die alles geben! Wann geht’s weiter?!?! Since Katie Ruggle`s Rocky Mountain K9 series I had come to like side character Steve a lot. Poor guy must have really been scared about all those incidents at Monroe to decide to move his family back to his hometown Borne,Colorado, to his enstranged brothers and no job. What a daunting persepective! Steve helps at the family Christmas Tree farm and works as volunteer for the local fire department. On a winter forest search he reconnects with Camille, once one of his high-school mates and now the town`s eccentric artist in metal works. While Steve´s four lovely kids like Camille and her odd ways instantly, Steve needs a little bit longer. But then strange things start happening around Camille, endangering her and her new found family´s lives. I love Katie Ruggle´s writing style! With just a few sentences she creates likeable characters and a setting you instantly feel at home in. Steve puts his childen always in first place and holds back on his own life. Maybe this is one reason why his and Camille´s restarted friendship is sooooooo slow going. I really love Camille, who might be a bit of an oddball, but this woman certainly has a strong backbone and a spirited way of thinking! It would have been an all romantic winter wonderland story, if not for that mysterious firefighter. First I worried one of those Monroe weirdos had secretly followed the Springfields. The twist at the end totally threw me. The villain is unmasked but insead of being hold responsible, the brothers cover it all up, which really annoyed me. I can´t imagine Steve and Camille are okey with this outcome! All of Steve´s brothers seem to have serious issues, so I wonder how Katie Ruggle will manouver out of this critical corner and weave stories for them next. Vanessa Daniels has done an absolutely brilliant job giving her voice to Camille, the awesome Springfield kids, Steve and his brothers. The interaction between Camille and each kid had been so sweet and the dialoges came across fresh and witty. Scenes like in the supermarket where she and Steve stand in front of a shelf and discuss serious teenage girl matters were hillarious! 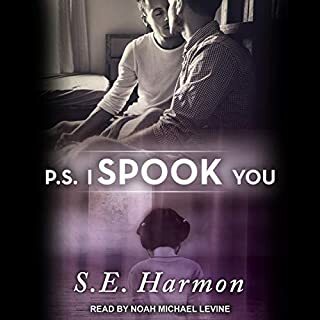 Vanessa Daniels and her voice easily managed to ensnare me for this 11 hour long Audio Book listening enjoyment. Every dreary day, Zach Driscoll takes the elevator from the penthouse apartment of his father's building to his coldly charmed life where being a union lawyer instead of a corporate lawyer is an act of rebellion. Every day, that is, until the day the elevator breaks and Sean Mallory practically runs into his arms. Substitute teacher Sean Mallory is everything Zach is not - poor, happy, and goofily charming. With a disarming smile and a penchant for drama, Sean laughs his way into Zach's heart one elevator ride at a time. Elevator rides that stole my heart! Priviledged and closeted lawyer Zach lives in the penthouse of an exclusive highrise in San Francisco his father owns. Every day he uses the elevator to get down and up again into his uneventful life with no friends. It is where he meets Sean from 14th floor for the first time. With each elevator ride the sweet substitute teacher with his love for authentic costumes to make his teaching lessons more colorful and compelling, warms Zach`s cold, lonely heart. But will they ever become more than mere elevator friends? The cover design implies that this might be a light read and manages to hide a real short-story gem at the same time. The story of Zach and Sean comes with low drama and a slow, simmering attraction. Despite the short word count the story spans over many month of many short elevator rides with timid smiles and brief conversations. It gives both shy men enough time for gathering courage and developing a true relationship. The chapters are clearly structered but are filled with so many little nuances, making both men feel so vivid with all their uncertainties, flaws and struggeling with everyday problems. Simply amazingly written, dear Amy Lane! I love it! A story that makes me smile from start to end certainly deserves a 5 start review! 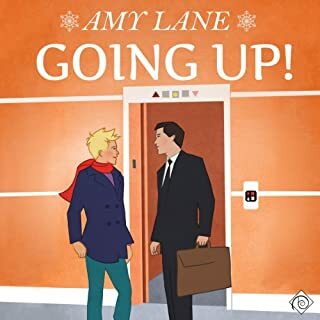 Paul Woodson did a fantastic narration of Amy Lane´s modern, heartwarming fairy-tale. His voice is simply perfect for Zach. His deep loneliness had already tugged at my heart in the book and is even amplified by his interpretation. Zach working as a union lawyer had not been a big enough rebellion to get him noticed by his conservative and political ambitious parents. Apart from his secertary Leah, Zach´s world seems grey and uneventful, until Sean bursts into his life. I love all those elevator scenes with their timid smiles and tender gestures that always get so harshly interrupted by the „Ding“! When Sean finally makes a move on Zach, gently but determined, the ivory tower falls apart piece by piece. The start feels like a punch to the gut following Alis´ confusion paired with amnesia when she jolts awake after a car accident in the middle of snowy Snowdonia. Painstaking slow memories and names come back to the injured, young woman. It becomes clear that Alis has been working under cover for the Manchester PD and the investigated place needs to keep their secrets at all cost, even not shying away from murder. On first glance the city and country cop ladies don´t seem to have much in common, but they are on the same wavelength when it comes to their job dedication and feeling for justice. As there seem other police officers involved in the whole mess, the two women have to investigate behind their commanding officers´ backs to unravle the truth. 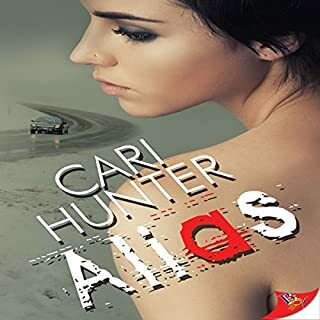 Cari Hunter has, again, written a true page turner! The story is well structured and mulitlayered, grabbing and intrigueing you right from the start. I like her eye catching word play title and love her character development. Both Alis and Pryce come across so vividly and their reactions and dialoges so natural that you can visualiz them instantly. From their first meeting at the rescue site, over akward hospital visits to secret stakeouts one can feel how they grow closer and more trusting of each other. The solving of the case clearly is the main goal, so there is little time left for their growing attraction. Maybe in this action overloaded world Cari Hunter´s story feels too slow for many readers, but that is exactly what I love about it. The slow putting together all those puzzle pieces feels so realistic to me, only intensiving my story enjoyment. Nicola Victoria Vincent has done a marverlous 8 hour narrationg job, giving each character, big and small, a perfect voice interpretation. 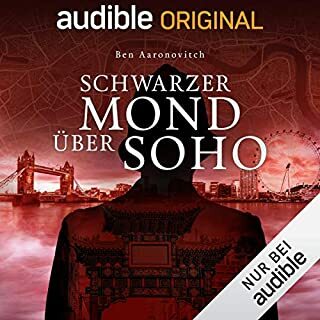 I can imagine that because of all the local references,words and the strong accents this audio book may be a bit of a challange for non-native listeners. For me it felt like coming „home“ after having lived and worked in the West Midlands for some time and also often visited North-Wales. Nicola Victoria Vincent´s voice talent truely brings Alis and Pryce „alive“, letting us listeners feel their pain, confusion, fear and determination, making both heroines sound credible and natural. This audio book has all what it takes to become one of my all time repeatedly listening favorites! Simply wow!!!! 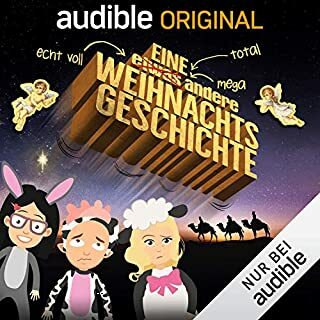 Ein Dankeschön wieder an das Audible Team für diese kostenlose Weihnachtsgeschichte voller hochkarätiger Sprecher! Das war knapp 2 Stunden eine kurzweilige und lustige Hörpause in Mitten des Vorweihnachtstrubels. Es ist eine ungewöhnliche Version der eigentlich bekannten Weihnachtsgeschichte, denn das diesjährige Krippenspiel der Theater AG des Goethe-Gymnasiums nimmt gleich mehrere unerwartete Wendungen. Plötzlich finden sich die Darsteller Louise, Josephine, Bruno, Emine und Robin samt dem Aushilfslehrer Herr Stritmann in der Wüste wieder und folgen dem Stern von Bethlehem in jede Menge verwirrende Zeitsprungfallen und bringen einiges ziemlich heftig durcheinander. Die Geschichte von Axel Hildebrand ist gut strukturiert, die Dialoge der Jugendlichen sind flott und altersgerecht geschrieben, aber man darf nichts zu sehr hinterfragen. Ich fand die Zeitreise Idee und das Nerd-sein von Louise wurden etwas überstrapaziert. Viele der Szenen in denen die Kinder und ihr verwirrter Lehrer ins Zeitgeschehen eingreifen, wirken statt komödiantisch eher merkwürdig. Die Wiederkehr zurück in ihre Zeit geschieht recht abrupt, der Schluß ließ mich jedoch schmunzeln. Denn die Theater-AG bereitet sich letztendlich auf eine recht eigenwillige Aufführung mit veränderten Rollen vor und neue Freunde haben sich gefunden. Die Sprecher der Kinder waren echt klasse! So schlagfertig und trocken wie Louise, Bruno und Emine wäre ich in deren Alter auch gerne gewesen, Muh! Man merkt richtig, wieviel Spaß der Erzähler und die Sprecher mit den verrückten Szenen hatten, denn die Dialoge hören sich flüssig und ganz natürlich an. Die Hintergrundgeräusche und Musik sind dezent und untermalen die Szenen passend. Man folgt der unfreiwillig zusammengewürfelten Truppe gerne durch ihr Abenteuer. Die kräftig gefärbten Dialekte vom Zensusbeamter und den Hirten empfand ich allerdings mehr störend als lustig. Reece is a practical, orderly man; a financial analyst who considers most holiday events wasteful. But his sister coerces him into standing in line overnight for this year's must-have toy. Supplies prove smaller than expected, and Reece gets trampled in the resulting stampede. Toy store manager Angel tends to Reece's wounds. When Angel discovers Reece's cynical attitude, he invites Reece to spend Christmas Eve with him. With Angel's guidance, maybe Reece can finally understand the joy of the holiday - and maybe even find love as well. When a Christmas toy crazy mob stampedes over Reece, he is totally out of his comfort zone. His sister, now a single mom, has bullied her dry,order and number loving brother into queueing all night in front of the store to get the most wanted toy for his nephew. Reece is patched up by the cute store manager Angel, who cannot let the holiday resenting man walk away. Instead Angel takes Reece on his annual Christmas Eve round and tries to show the cynical man that Christmas not only is a commercial trap but also means joy, happiness and maybe even a chance for love. In this short story Kim Fielding has thrown together two men, who couldn`t be more opposite. Reece, the analytical, sober mind and Angel, the warm and soft-spoken one, and not to forget determined. I admire his energy and patience not to give up on grouchy Reece but continue to pull him along all afternoon. For Angel I felt a bit sorry though. Poor guy being baptised with such a name and certainly having gone through lots of jokes and bullies as a kid himself. Alex Freeman`s voice goes through all nuances bringing unromantic, sceptical Reece alive. The scene in front of the toy store was so comical with runned over Reece sounding so incredulously disbelieving, it made me laugh out loud. Angel, in his heart never fully grown up, was portrayed kind and endlessly patient. Maybe the story had been too short and too fast, as I couldn`t feel much of the chemistry between both men. Still a funny, lovely story with two likable MC s and an end that brought everything together nicely and left me with a satisfied smile. The mayor of Cincinnati gets threatening emails from his deceased wife. To keep it low key he hires PI Shane, who convinces Rowe to lend him his IT specialist Quinn for this delicate case. Quinn reluctantly leaves his safe computer den at Ward Security and sets up work in Shane`s cramped office. Although the attractive PI and the moody IT and game nerd seem to have nothing in common, the attraction between those two is kind of magical from the start. What was supposed to just have a fun time with no strings attached after the job, soon turns into a lot more. When digging deep and unveiling secrets long kept hidden, their ongoing investigation speedily and deadly escalates. Gosh, Drake+Elliott really know how to write and keep us readers glued to the story! Quinn and Shane have so much chemisty between them, one can almost feel it sizzling through the chapters. Following their development from just friends with benefits to a solid relationship was intense and hot. Meeting Quinn's mother and Shane's father further let my sympathy for those two special men grow. 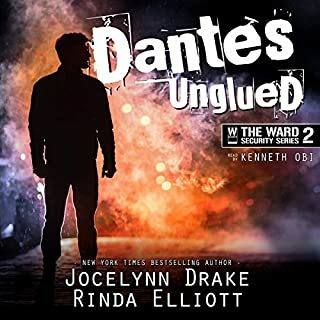 The storyline is fast paced, the twists are unexpected and the mystery is well structured, although the criminal part seems cut a bit short in favour of the blossoming relationship part. Kenneth Obi`s voice adaptation for Shane is simply perfect and sounds so deep velvety and warm as I had already imagined it when reading the book. He brings out Shane`s honesty, solid working attitude and welcoming nature well. I also found the intimate scenes were read with such sensitivity, that Quinn discovering his dominant side was very convincing. The banter and cameraderie between all Ward Security colleagues was narraterd fresh and lively by Mr.Obi, too. Just doing female voice interpretations he sounds less convincing. Lucky him, in Drake+Elliott`s Cincinnati universe there are only few women protagonists. Kit and her absolutely adoreable Bloodhound Justice come as reinforcement to the Monroe PD. At the same time Jules and her friends welcome the mysterious Elena as a new arrival. Theo,Hugh and Otto know the drill and leave Elena alone, which totally buggs Kit. Is she the only one feeling that there is something not right with Elena? Everyone in town wishes for some calm and normality, but with a house burning down and an unknown dead woman inside this is not going to happen. Kit struggels to fit into her new workplace and still follow her gut instincts. Luckily she meets Wes, the recluseded fire watchout guy. Although they make an odd pair, they are simply made for each other including Justice and Robocat. 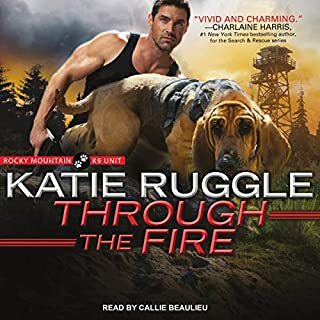 Gosh, I had been so curious how Katie Ruggle would introduce another main character into the sworn in K9 guys group. Even though Kit has a hard time winning the trust of her colleagues, Theo, Hugh and Otto are always fair to her. Justice ,the ever happy, slobbering dog, has it much easier. I always thought Jules` stepmother would be the biggest threat, but when Courtney finally makes a personal appearance, I had to rethink that. There was a much bigger show-down still waiting! Wow, what unexpected twists! Even if those final scenes feel a bit unrealistic, you know what? I don`t care.This series is so engaging, highly entertaining and so totally addicting, I simply love it! Knowing there will be more stories around sympathic fire fighter Steve soon, I hope my favourite Monroe characters will have a chance to appeare in the new series,too. And maybe there will also be a story for Mr.E, he really would deserve one, don`t you agree dear Katie Ruggle?! Callie Beaulier has outdone herself again with reading those close to 11 hour long, fast paced winter adventure. She really brings Kit`s wiry, detrminded strenght and dry sense of humor alive. I had to laugh out loud over her incredulous reaction comparing the town to „a horror movie with a post apocalyptic plotline involving zombies“. Thanks to Mrs Beaulier`s great voice talent Kit and Wes become so sweet,sympathic and just fit seaminglessly into the rest of the K9 bunch!